When you’re a little nugget in a big world, things that go bump in the night can seem pretty scary. Night lights are a time-tested tradition when it comes to helping children to feel comfortable sleeping on their own at night. Some night lights are simple shapes you plug into the wall, but kids always want something with a little pizzazz, don’t they? The following ten night lights are some of the most creative and well-reviewed on the market. We just know your little ones will get a good night’s sleep with these fun pieces to gently light up their room. We’ve recently made some significant cuts to this page to bring you only the ten very best night lights available. We’ve replaced any out of stock products with up-to-date and available models praised by other users. We know sleep is important to you and your kids, so set them up for sweet dreams with one of these fun night lights! Sometimes an after-thought, a night light is an important part of a baby's nursery and later a toddler's room. A number of different styles made our list--from sleek and simple to fun and entertaining, making it easy to choose a night light that is right for your child. Sometimes the most effective gizmos are those that are as unpretentious as the Safety 1st LED Nightlight. 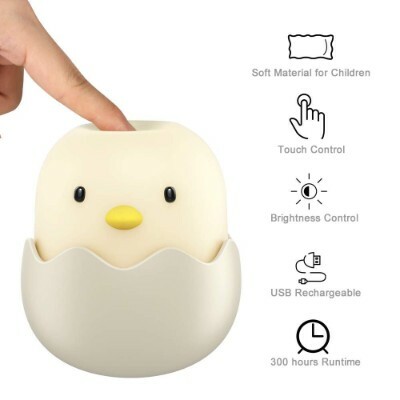 This plug-in night light is one of the most energy-efficient bedtime lights you can ever use in your baby’s bedroom, making it a great night light for babies. The design is ridiculously simple. 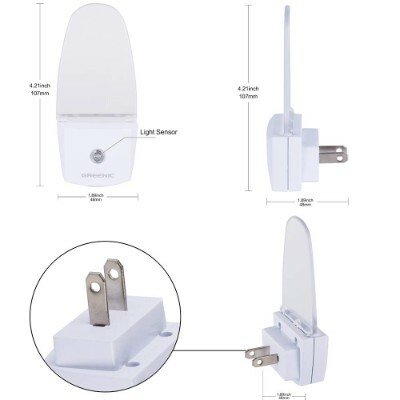 You have an electrical male plug with a glass attachment sticking out from its top portion. The glass serves to soften the light emitted by the LEDs of the light. There are no fancy characters that can distract your child during the early hours of bedtime. This simply means your kid will be able to sleep a lot faster and sounder because of minimized stimulation. The product boasts of savings of up to 87 percent compared to standard night light bulbs. This can translate to better economy and more practical uses of the money saved. You can now plan for a much-awaited trip to Disneyland or even open your kid’s own savings account. It also lasts up to 25 times longer, making it superbly efficient. 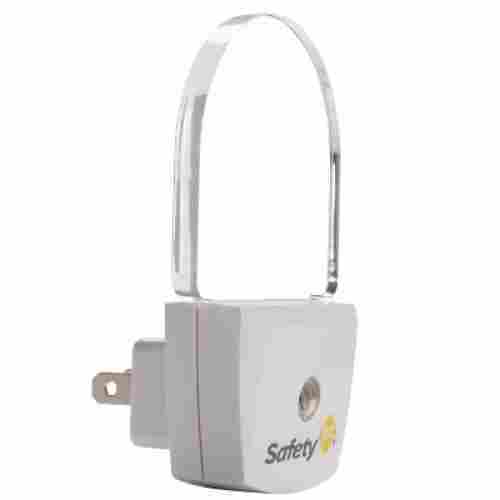 The glass structure of the Safety 1st nightlight is an excellent insulator and as such you will feel more confident about the safety of your child even if he or she is driven by curiosity to touch the magnificent glow of the LED night light. 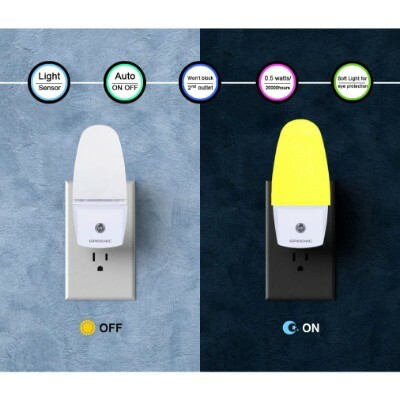 This LED Nightlight by Safety 1st is much like a traditional night light, because you simply have to plug it into the wall for it to operate. This sleek night light is cool to the touch so you will never have to worry about your little one getting burned if they decide to touch it. Putting out a soft, warm glow, this Safety 1st light adequately emits enough light for your toddler not to be frightened yet does not disrupt sleep. Your best assurance is that the electric components of the Safety 1st are all UL-tested and certified. Now, you can safely go to bed, feeling more confident than ever that your little angel is safe with the Safety 1st. 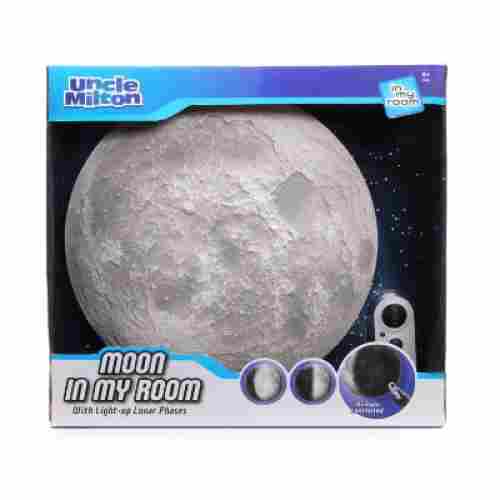 It’s 12 night lights in one, as it works through the 12 phases of the moon, and even includes an MP3 download that explains and gives a guided lunar tour. Hang the light on your child’s wall so that they can fall asleep basking in the moonlight--real and otherwise. The night light and remote require four AA batteries and two AAA batteries, but the auto shut-off function will help to save power. Simple assembly required. 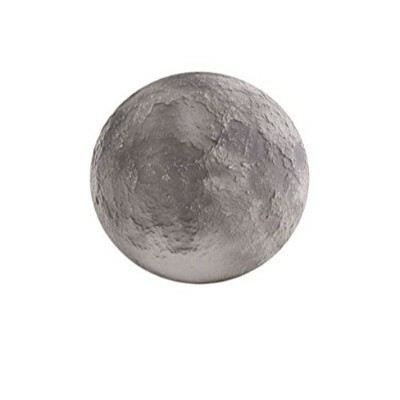 The light is textured with careful detail to resemble the moon, and will shut off automatically, though it also includes a remote control for manual functions. This produce is best-suited for children ages 6 and up, and presents a wonderful opportunity for your family to learn about the solar system while tucking in for sweet, spacey dreams. The Sensory Moon Bubble Tube takes night lights to the next level. 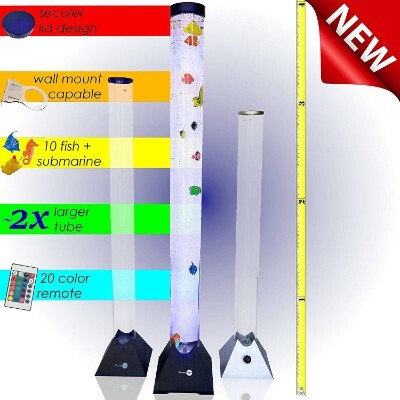 This 3.9-foot light is filled with water and plastic fish. When the light is turned on, bubbles will appear inside and the fish will swim up and down the tube. The cap stays shut tight. The lid on top of the tube guarantees that no water or fish will spill out. Their knowledge of colors will increase as the light changes. The bubbles and lights will provide a calming effect on children, especially those with disabilities and autism. 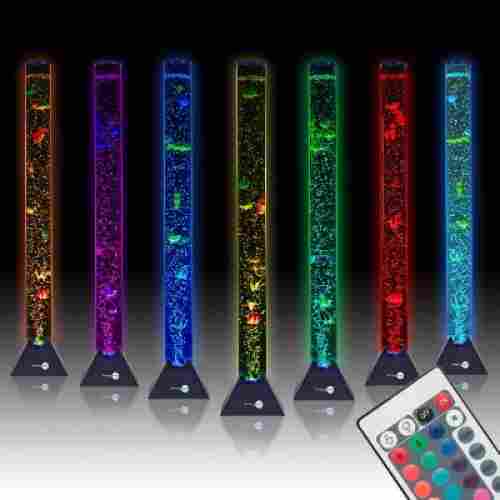 A remote is included so your child can easily choose one of the 20 color lighting options. There are 16 solid colors so your child can set their favorite color as their bedroom night light. Furthermore, there are four transition settings that will cause the lights to flash, fade and strobe. While it is not completely silent, the bubbling noise and motor provide your child with just enough white noise to get them to sleep. Each of the 20 color options will stimulate your child’s development and can easily be controlled by using the remote. 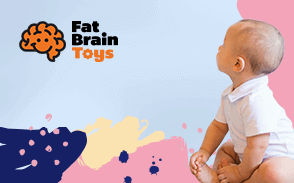 This light will stimulate your child’s sensory development in a variety of ways. Your child will improve their object tracking as they watch the fish swim up and down the tube. Ever wish you could control your child’s sleep schedule from your phone? Well, this isn’t a far shot from that dream. With Hatch Baby, you can customize color, brightness, volume level, sounds played, and time-to-rise alerts, all from an app on your smart device. This item is perfectly safe for little ones to use and be around. You can set a bedtime musical routine for your little ones that will play and flash colors when it’s time to start winding down for sleep. Similarly, time-to-rise can help children to know when it’s okay to get out of bed so mom and dad get a few extra winks. Newborn baby needs a midnight snack? 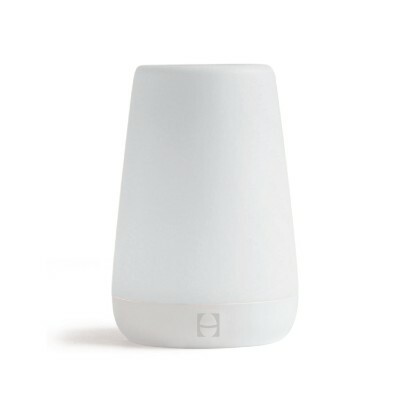 This night light will play comforting white noise and provide soft light for the meal. Got an anxious toddler? Let them help you choose the color and brightness they find most comforting at night. Older kids don’t want to rise and shine in the morning? The time-to-rise setting lets them know they need to get their tooshes up and start the morning routine. It’s designed to be able to grow with your child, with special features for each age group. Sound and color combinations have all been recommended by experts to provide the most comfortable sleep environment for your family. 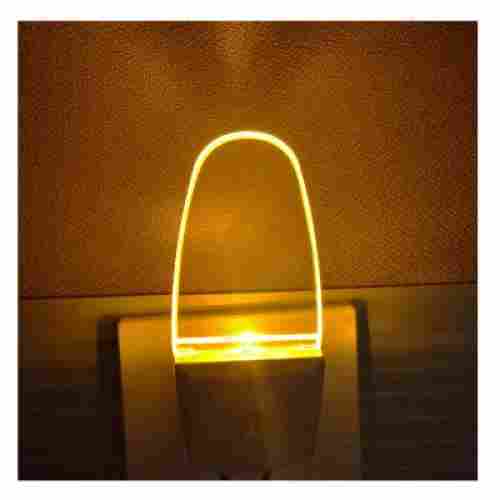 This LED night light by Greenic has a sleek and slim design that will fit in with any type of decor. 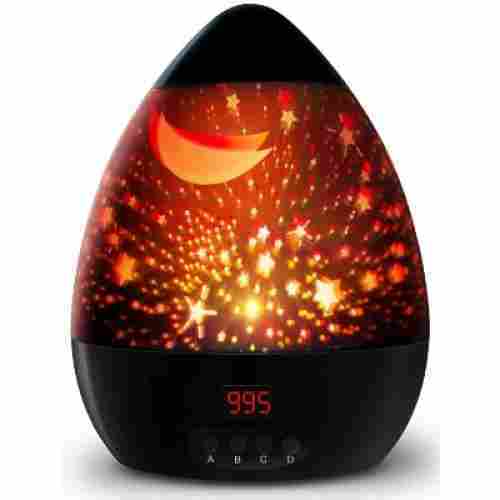 It emits a soft, pleasant glow that will not harm your baby's or toddler’s eyes during the night. This Greenic night light for kids is made very much like standard night lights as it only requires an electrical outlet to produce light. You’ll save on power usage in view of the fact that this light will only come on from dusk to dawn. Putting out a subtle, calming glow, your kid will feel relaxed as they fall asleep with this innovative night light in their room. This package includes two Greenic Plug In Dusk to Dawn night lights, so if you kid has a fairly large room, you can place the night lights at opposite ends. Furthermore this is a wonderful night light to place in the bathroom as it will not block the second outlet, freeing it up to plug in your blow dryer. Due to this plug-in night light’s low electricity consumption, you will never have to replace the bulb as this soothing night light has a lifespan of 50,000 hours. Your kids can learn about energy consumption and the cycles of sleep with this nifty night light. We bet this cute little chickadee is almost as adorable as your little one--almost. They’ll be a perfect pair; this Tecboss night light features 300 hours of battery when utilized on its lowest light setting. On the brightest setting, it can run for eight hours before needing a quick full charge. The material is soft, so even if little ones are doing it themselves, their sensitive little fingers are guarded. Touch and hold the top to adjust the brightness. And the chick can swoop and sway side to side without falling over thanks to its tumbler design. The light it emits is soft so it won’t wake up infants or keep toddlers stimulated, but it’s still enough luminous action for you to be able to comfortably handle a breast-feeding or diaper change in the middle of the night. Just touch the chick’s head to turn the light on or off. This night light is a great companion for younger kids, from infants to toddlers. The chick design is super cute and accessible, and it’s easy to operate. The light is soft so it won’t hurt anyone’s eyes or keep children up at night. 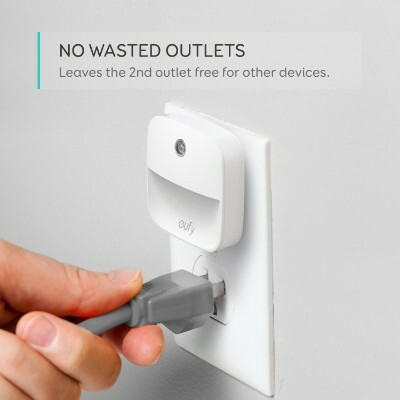 This traditional lump plug-in night light by Eufy measures 2.4 x 2.4 x 1.7 inches, making it the perfect size for any wall outlet, without blocking the outlet beneath it for the fact that it is compact. This is a very safe option as a night light to have in your kid’s bedroom in view of the fact that it does not have a bulky electrical cord attached to it and it is effortless to operate because your little one will never have to touch it turn it on. 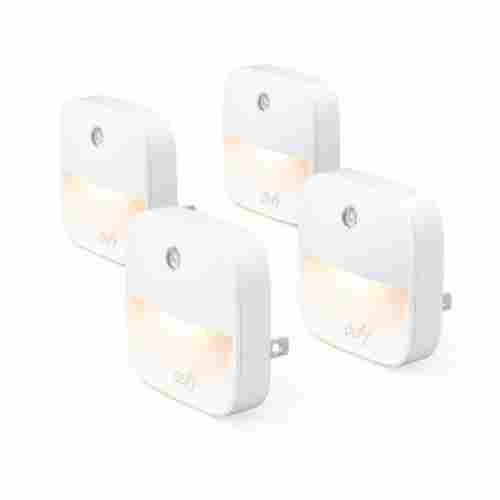 Furthermore, this is a four-pack of night lights by Eufy so you can place them in your hallway and bathroom to light the way for your kid as they wake up to take potty breaks during the night. It does not have a harsh glare or flicker so that whenever your little one wakes up during the night it will not harm their vision. 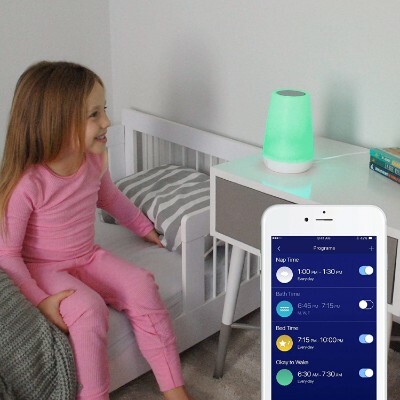 This Lumi night light may be small in size however, it emits the perfect amount of light so that your toddler will not will feel like they are in the dark. Although this night light for kids does not detect motion, it does sense when light is low and will turn on,in contrast it also senses when light is bright and will turn off. 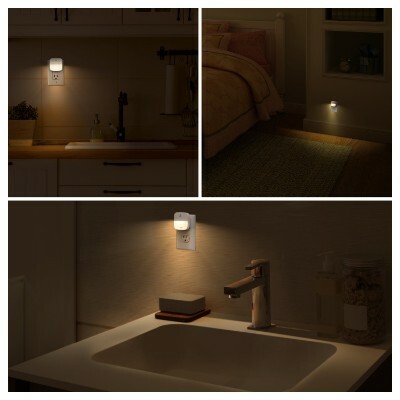 This night light is energy efficient as it only emits light from dusk to dawn. Being an energy efficient night light, it costs less 30 cents per year to operate. This Star Light Night Light by Hontry is amazing for babies and toddlers as it has four lights in the colors of green, red, blue and warm white to assist your little one in falling asleep at bedtime. You can use four AAA alkaline batteries to power this colorful night light on, or you can use the USB cable. It is important to note that the batteries and USB cable should not be used at the same time as doing so could cause the night light to function improperly. 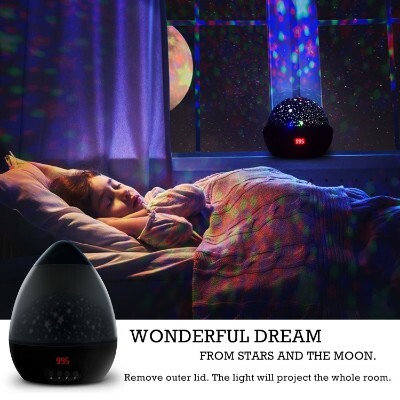 It has a wonderful automatic shut-off option that allows you to keep it powered on from 5 to 999 minutes, to ensure your kid will not wake up to a dark room, but to an amazing star light show. Even better, this rotating projector light has two power options for your convenience. Promoting confidence and independence, this kid’s night light by Hontry is very easy for little ones to operate as it only has four buttons. 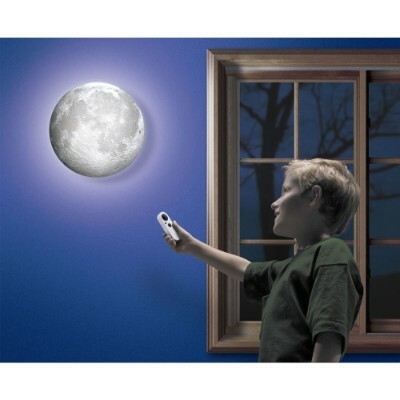 For the fact that this starry night light can be powered on by using batteries it has maximum portability so that you and your toddler can travel with it and even use it outdoors, like on a camping trip for example. In addition to bedtime, this night light can be used during your kid’s birthday parties, holiday parties and other festivities. This night light is a simple way to create a pleasant, serene mood for your toddler before they fall asleep. Young boys and girls will love this dazzling Cloud B Twilight Turtle night light as it is a plush toy that can create a starry sky on their ceiling. Our turtle measures approximately 5.5 inches tall and 14 inches long making it the perfect size for a bedtime companion. Our turtle twilight night light takes four AA batteries to function properly, making it easily to transport and travel with, such as to night time bathroom trips and even to summer camp. The turtle itself is made of soft, plush material and its shell is made of hard plastic with magical constellations. 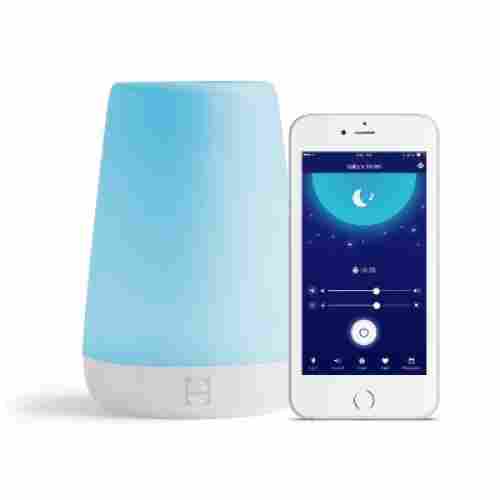 Although it does not play music, it has three color options to project onto your kid’s bedroom ceiling, blue, green and yellow. Our plush turtle is very efficient as it powers off automatically after 45 minutes of use, ensuring that your little boy or girl will be sound asleep before the light goes out. In addition to that, the room has to be dark in order for it to emit light onto the ceiling. It’s starry shell includes eight constellations and even comes with a detailed illustrated Twilight Turtle Star Guide to help your kid identify them. 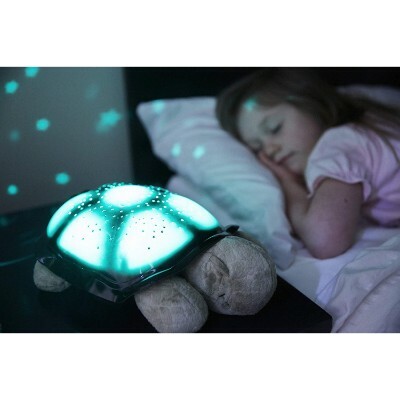 Our turtle is not only a great night light and bedtime companion but it’s an awesome teacher too. 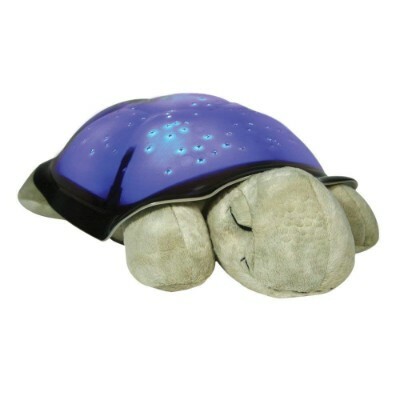 Your kid will love having this Cloud B turtle around as they fall asleep underneath a starry sky. 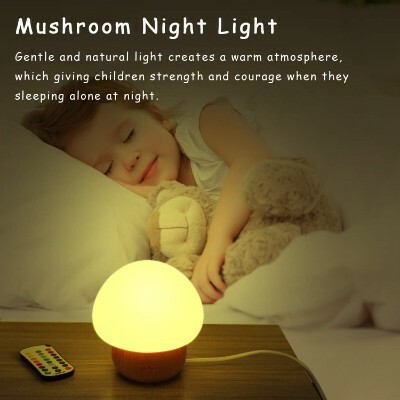 With four different speed changes of 15 different colors, this LED Mushroom Night Light by ANGTUO can suit any mood that your kid may be in. You can put this light in stable mode or flashing mode to put on a fun show before bedtime. The mushroom also has a mode of where the colors gradually change in a slow soothing manner. 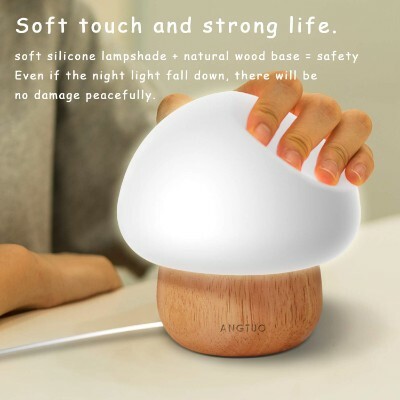 This beautiful night light has a natural design as the base is BPA free, made of natural rubber wood and the light shade is made of soft silicone. 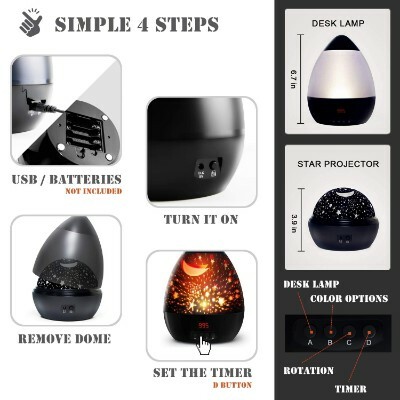 BENEFITS This cute night light can be used in a variety of rooms such as your living room, kitchen, bathroom and kid’s room of course, due to the shape and design of it. The plug cannot be removed from the night light so you won’t ever have to worry about your kid detaching it. It’s soft subtle lighting can turn your little one’s bedroom into a very peaceful space to ensure a restful night of sleep. This night light is simple to operate as it comes with a US outlet plug. 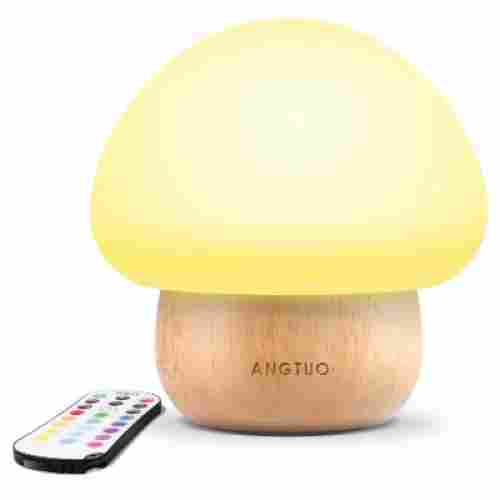 This ANGTUO night light can promote independence as the wireless remote is color coordinated to match the light in which your kid wants the mushroom to reflect. Safety is a huge factor that we took into consideration when selecting night lights for our list. All of the night lights for kids on our list are safe for kids to be around and handle. All of the night lights on our list are well-made from durable materials to stand up against frequent use and will not easily break due to factors such as being bumped or dropped a few times. Every night light will help your child to have a restful night of sleep. The main point of a night light, especially for kids, is to help them sleep comfortably. As a parent, you don’t want your child to be afraid of the dark or to have a fear of falling asleep. Additionally, you don’t want your child to be scared to get up to walk to the bathroom at night. The traditional standard night lights such as the Safety 1st LED Nightlight are great for illuminating hallways and bathrooms since they come with multiple lights that do an amazing job at lighting a path for your kid at night time. Whether it’s a toy, gadget or a light, no matter what your kid has, as a parent you want your kid to be able to learn. We chose several of the night lights on our above list solely for that purpose. With these night lights, kids can learn about energy efficiency and they can stimulate their auditory, tactile and visual sensories. Neurological sensory development is very vital for young kids as it plays a key role in how kids will perform in life as they grow older. 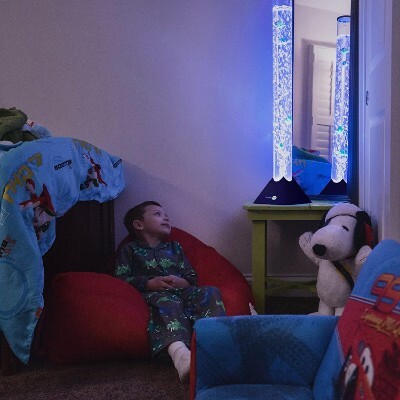 With the soothing lights and sounds that many of our night lights have, kids let their bodies and minds relax as they fall asleep to the subtle, soft glow of these lights. Each of the night lights on our list above provides an adequate amount of light for young kids to see their way around their rooms during the night, yet the lights are dim enough not to disturb your precious little one as they are sleeping. You can rest comfortably knowing that these night lights are cool to the touch after being on for a long period of time. 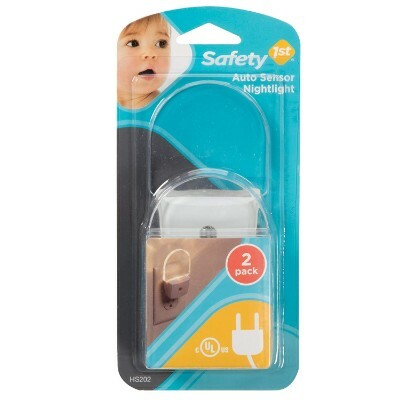 Your kid will not become injured if they accidentally or intentionally touch these night lights. Another great feature is that several of the night lights on our list are made from Acrylonitrile butadiene styrene, also known as ABS. ABS is a durable plastic with the chemical formula of (C8H8)x· (C4H6)y· (C3H3N)z) that has no true melting point, making it fireproof. None of the night lights listed above contain harmful, toxic materials such as BPA or lead. Your kid can safely enjoy these night lights as they sleep peacefully each night. There are many reasons why kids need a good sleep. For the most part, it aids in their optimum growth and development through the action of hormones that are vital to the building and continuing development of cells and tissues in the young body. While we can always teach the importance of sleep to kids, it is equally important that we help them get to sleep earlier and faster. Here are some things you can do. Set up a routine for kids to follow and be consistent about it. It’s okay to be flexible but make sure it’s reasonable. Taking a bath or reading them a story before bedtime can help set their minds into entering the sleep mode. The idea is to train the body into reducing its mental and physical activities at a given time. For instance, if you make it a habit to read a story before your child goes to bed, then his or her mind and body will “remember” and “associate” bedtime storytelling as a sign of going to bed. Over time, their bodies will automatically go into a slow-down mode every time you read them a bedtime story, regardless of the time. It’s a conditioned response. Provide comforting toys and sleep aids. Some children prefer sleeping with their favorite toy or even favorite blanket. Make sure these are available an hour before bedtime to get your tot ready for bed. If they have a favorite lullaby, you can play that, too. What you want to have is for kids to feel more relaxed, calmer every time they go to bed. So, anything that can make them feel more secure or relaxed will work. Create an environment suitable for sleeping. Turning down the lights and playing soft music generally helps. This is where night lights for kids can come in very handy. Keep the bedroom temperature cool enough to help facilitate faster transition into sleep mode. It has been proven that certain hormones respond better to a drop in body temperature which favors the transition to sleep. Focus on relaxation, not the idea of having to go to sleep. It usually is stressful for kids to know that they “have to” sleep because they need to. Instead, focus on calming and relaxing your child until such time that they fall asleep. That said, it is often not a good idea to go to bed with a very anxious child. Remember, stress means an increase in cortisol which, unfortunately, can have an adverse effect on the body’s ability to fall asleep. Know the sleep requirements of your child. It is important to understand that different age groups have different requirements for the number of hours of sleep. Furthermore, understand your child’s unique characteristics. Early risers will always wake up early even if they stay late at night so be mindful of this. We then looked at other features that have made the product such a huge hit among consumers, past and present. That’s why consideration also was given to customer feedback, particularly those who have made quite extensive reviews about the product. These served as great sources of insight, enabling us to gain a better understanding of how the product fared in the real world. At any rate, it gave us an idea whether we are heading in the right direction or not. q: What is the best color of light for kids to sleep under? The best color of light for kids to fall asleep to will vary because all kids are different. However, numerous studies and reports show that the red spectrum may help kids to sleep better at night. It may seem a bit counter-intuitive for the fact that night lights with blue hues are popular, but they actually keep kids awake longer. Young eyes are much less sensitive to the color red because the wavelengths are longer. Due to this fact, your kid will get more rest if they sleep within the glow of a red light. q: When is it a good idea to use a night light? 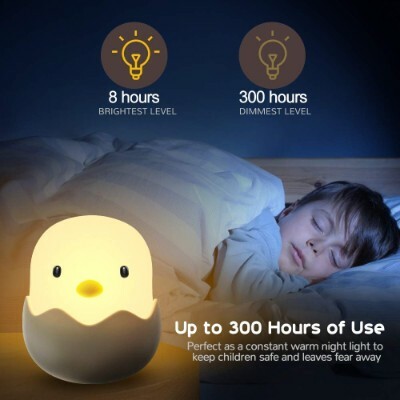 For comfort: If your toddler is just learning how to sleep alone as opposed to sleeping with you, then a night light may help them be comfortable enough to sleep alone. Diaper changes and nursing: Newborns have to be changed several times a night, in addition to frequent nursing. Turning on a bright light to change diapers or nurse may keep your baby awake all night. The subtle glow of night light will help to ease your baby back to sleep. Potty training: Potty training is usually a tough time for toddlers. 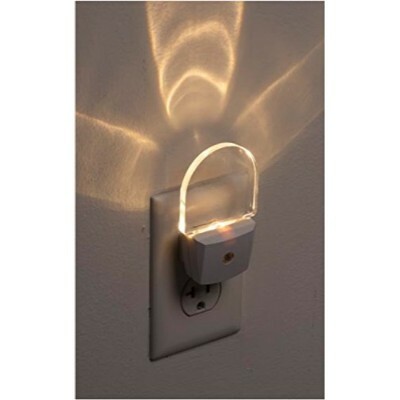 A night light, especially a portable one, will encourage them to get up to take trips to the bathroom during the night. q: When should I take the night light out of my kid’s room? It disrupts their sleep: Scientific studies show that a dark environment tells our brain to release melatonin. Melatonin is a sleep hormone that makes us sleepy. A night light that is too bright will disrupt sleep, causing your kid to have a restless night. They want to play: Many kids associate light with staying awake, and for this reason they may want to play. If your kid’s toys are visible, they may sneak out of bed and want to play simply because they have a night light in their room that makes them visible. q: What are the benefits of dusk-to-dawn light sensors? Dusk-to-dawn night light sensors provide a variety of benefits and are becoming more and more popular. Firstly, dusk-to-dawn light sensors operate properly whether someone is around to make sure or not. These innovative lights will cut costs on your power bill because they only come on when needed, at dusk, and it turns off on its own when it is not longer needed, at dawn. With a night light that has a dusk-to-dawn sensor, you will never have to worry about wasting energy or if your kid’s night light it on, as long as the light is plugged into a working electrical outlet. q: Is image rotation on the Projectables Tropical Fish LED Plug-In Night Light manual or automatic? The image rotation feature on the Projectables Tropical Fish LED Plug-In Night Light is manual. This is great because it allows your kid to choose the specific image that they would like to sleep under. To change the image, all you or your kid has to do is turn the nobbed wheel. Kids will enjoy being able to pick and choose from six different images on this projectable night light. 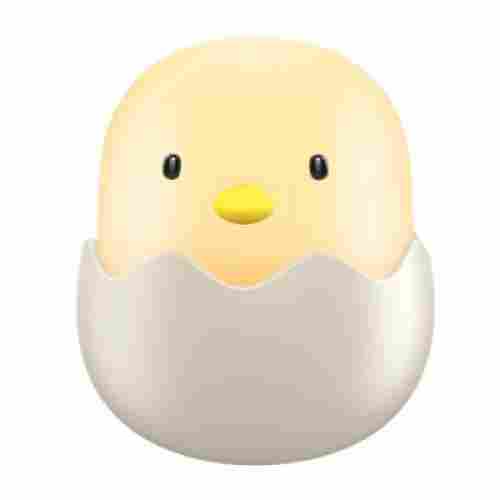 q: Can I leave the VAVA Baby Night Light plugged in so that I will not have to charge it. Keeping it plugged in will hinder your kid from being able to carry it to the bathroom with them which may cause them to wet the bed. Keeping it plugged in all the time will damage and eventually drain the battery. Keeping it plugged in will consume more power, which will not save you in energy costs.